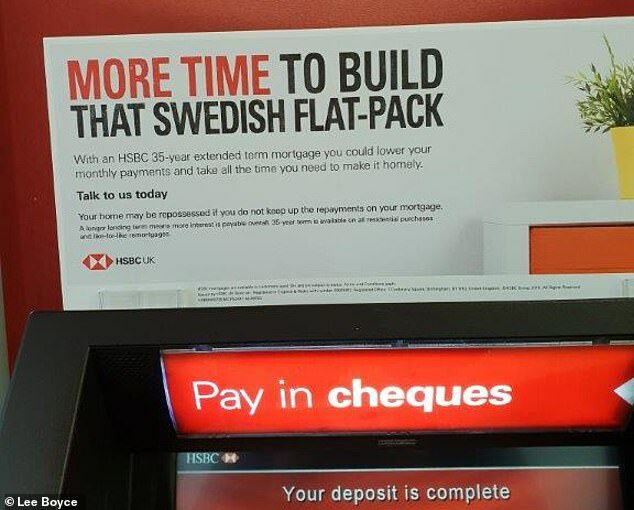 I was recently paying in a cheque (remember them) at an HSBC branch in affluent High Street Kensington and I couldn’t help but read the advert dotted above most of the machines. This small print could be worth £57,500 to the lender. Why? Well, crunching the sums, if you borrowed £400,000 at 2.44 per cent – a not unlikely scenario in Kensington – you’d pay back £595,203 over 35 years, if the mortgage rate remained constant. Borrow a mortgage over 30 years, a now commonplace term, and the total cost would be £564,492. 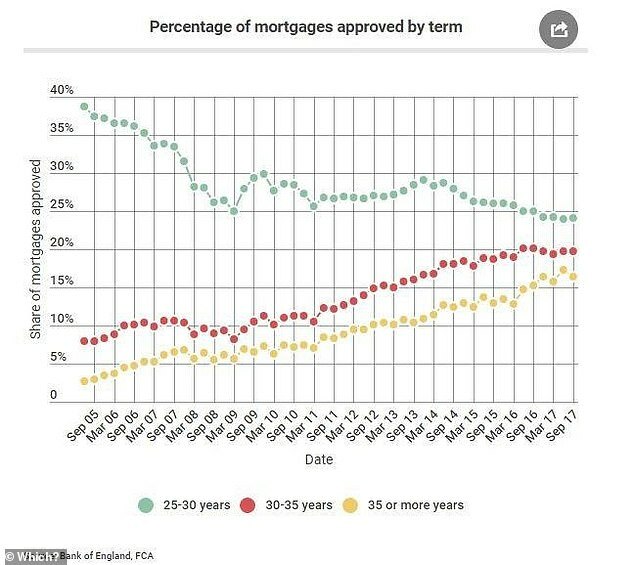 But take out a mortgage over 25 years – the traditional length of a term, which has fallen out of favour thanks to surging property prices – and the bill would be £534,721. That is a significant difference. Yes, monthly payments are £1,417 versus £1,568 for 35 years against 30 years, but that interest should make you seriously consider whether you can tighten your belt and pay an extra £150 per month. I’ve picked £400,000 as the sum to borrow as I was near This is Money HQ in Kensington and it is the maximum amount someone can borrow on a 10 per cent loan-to-value with the high street giant. That said, you wouldn’t get much in the W8 postcode for below half a million quid. Meanwhile, 2.44 per cent is the best rate on offer from HSBC with a five-year fix with the same LTV. Even if you downgrade the amount borrowed to a more normal sum, for example £150,000, the cost of having a 35-year mortgage rather than a 30 or 25 year one is significantly higher. In the unlikely event that you could get a steady rate of 2.44 per cent over the lifetime of the loan, the 35-year mortgage will cost £216,539 to pay back, while the 25-year one will cost £196,036. That’s a difference of £20,500. I’m not picking on HSBC here. The bank is offering an increased term and it is up to homebuyers to decide whether it is worth an extra five years’ worth of interest. Furthermore, first-time buyer friends who have recently had an offer accepted on a home, tell me they have a mortgage-in-principle for beyond this term from a rival provider. Around half of mortgage lenders are now said to offer 40-year mortgage terms – and if you added that to my example above, you’d be talking about £626,835 total payable, with a monthly outlay of £1,306. They say they were recommended the product from the lender – which I will not name as it was confidential conversation – and that worries me. Additionally, they told me they could overpay the mortgage by 10 per cent per year, which is fairly commonplace. However, if that is the case and they have the means to do so, it makes far more sense to go with a shorter mortgage term. Many become so blindsided by the need to get on the property ladder, they may not be taking their time to look at the boring stuff, the stuff that can lump thousands of pounds of interest onto a property loan. Instead, they be having their heads turned by the fact a lower monthly payment is good for their bank balance in the short-term. I’m not saying a 35-year mortgage term may not fit for some buyers, either. But it’s food for thought after probably spending years cobbling together a deposit, that those who may not understand the full ins and outs of a mortgage, could be stung with a longer than needed term simply by not understanding how a property loan works. And it is not entirely their fault. There was a distinct lack of financial education at school and many do not like talking about money, so are happy to swallow advice from so-called experts at financial providers. My £57,500 example above would be enough to buy more than a thousand Billy bookcases from Ikea, the Swedish furniture giant’s best seller. Although, I do not recommend building more than one item of flatpack furniture a month for your own well being.